This week, we explore Habit #3 in the 5 Essential Habits for High Performing Cultures. Faster, better decision making is a critical success factor for every organization in today’s change-centric world of work. In business today, it all boils down to understanding your customer better. Let’s look at a few examples. –You sit in a small-town airport for an extra 3 hours because the gateway wouldn’t retract, so the plane could not push back. (No mechanic or part available – it’s a small town.) After it’s fixed and the plane is once again boarded for departure, the flight attendant makes an announcement: “Ladies and Gentlemen, You are entitled to flight credit since our delay was over 3 hours. Please write to customer service.” Upon doing so, Customer Service denies your request, stating the incident was not the airlines’ fault. –You check into a 3.5 star hotel after a long travel day. You realize you haven’t eaten in 8 hours, but room service is closed. The hotel front desk clerk offers to order you a pizza. 30 minutes later it’s hot and ready at your door. You realize the next day, it required an employee of the hotel to go pick it up. –You are visiting a friend in the hospital. The patient in the next room is on the verge of death. The family is distraught. The organ donation people arrive. (a legal part of the dying process in a hospital.) The nurse shouts at them to get off the unit; everyone in the wing witnesses the incident. Nobody seeks to comfort the family. All of these are situations that actually happened. Which of these scenarios would leave you wanting to do business with this organization again? Three of these situations illustrate decision making failures, enacted through leaders who fail to train their people on the experience they want customers to have, and on how to make decisions internally that support that experience. Every company culture I have worked in over the past 15 years, without exception, needs to examine and improve decision making in the face of speedier and more frequent change. The only way to adapt quickly enough, is to train the organization how to make better decisions, faster. Especially when it comes to adapting to serve the insatiable appetites of customers. This requires collaboration and cross-functional skills to be honed to a fine point, a sword tempered in the fire of constructive, honest debate and dialogue. In most organizations, too many decisions are made by too few people at the top. Good decision making is a powerful mechanism for leadership development. Senior executives are promoted because they make good decisions. By the time they are VP level or above, they often don’t have the perspective for effective granular decision making. They also do not see their role as developing others to make better decisions. Relying on a few people’s instincts in decision making does not an adaptive, innovative culture make. When you have not formally mentored or developed OTHERS to make good decisions, the catch-22 is that at first, people aren’t going to make the best decisions. Like anything else, it takes practice. “I don’t trust that person to make a good decision, it’s too risky” creates a dangerous self-fulfilling prophecy: You don’t have people who are strong enough to make decisions, you make all the decisions, which results in nobody else learning how to make good decisions. This has been exaggerated by the over-use of matrix structures and the mass exodus of middle management to cut costs in almost every industry. This means decisions are often disconnected or removed from people who are closest to the customer or the action. In my view, decision rights and decision making is essential work of the modern organization. Teaching people how to make good decisions. 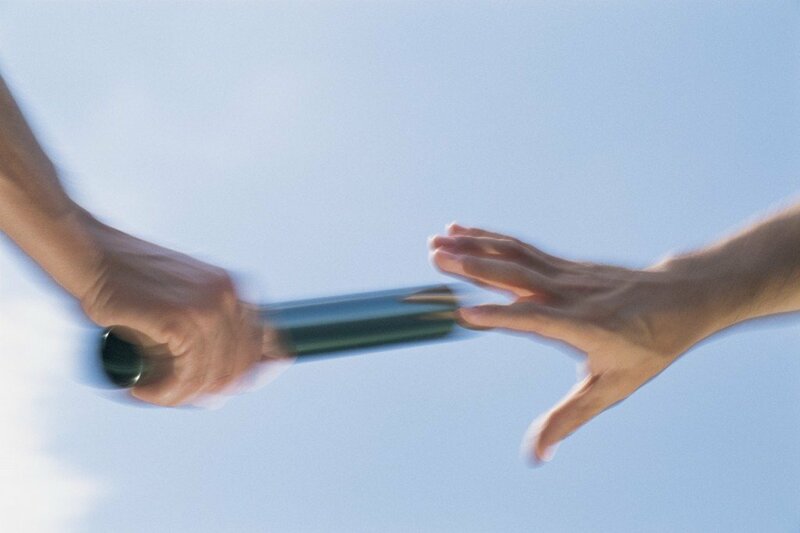 Pushing decisions to well-trained people who are close to the customer. Ensuring people share and learn from mistakes across the business. There are also many, many more decisions in your organization – training, purchasing, product development, technology, that do not stem from a customer standing in your line of sight. And, I propose this: You ALWAYS have a customer. (internal or external.) Someone is always affected by your decisions, and has the choice to respond or not … to decisions made or not made. And yet, most organizations do not invest time and resources in defining an explicit decision making process. Nor take time to clarify who should be making decisions about what, and teach and mentor managers on how to do so. Instead, I see companies seeking to encourage employee engagement, instead derailing their adaptability and speed by making perilous decision-making mistakes. 4 Top Decision Making Pitfalls. Do you fall prey to one or more of these in your company? Decisions are bounced around and around within or across teams, before escalating to a senior executive who finally makes decision out of exasperation, often without sufficient context. In the process, it upsets his peers, and impacts many people negatively who were not considered. Infinite appeal. People make decisions but leaders question and second guess the decisions they don’t like, or escalate decisions to leaders they know will sympathize, who swoop in and retract them. Decisions are made without context for the people who have to implement them. Sales made their quota, yay! Delivery and customer service, good luck! Start now, with these steps to fostering a sound process for improving decision making in your organization. Cascade the decision rights to the next level of management. In an organization with 7-8 levels of hierarchy, this can take time and a lot of patience. Identify the decisions you want your front lines being able to make. What training is needed to empower and trust them to make good decisions? Teach the entire organization about good decision process. 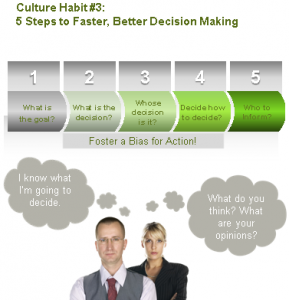 In our Culture Builder Toolkit, we provide a tool for 5 steps to good decision making. Ensure you have something similar – a common language for how we approach decision making. It is not always easy to get this right. It will test trust and communication skills among leaders. However, the conversations and effort are very powerful, and pays off in developing leaders and talent who work together to build a culture that delights its customers and fosters competitive advantage.